Tape Dispensers: We carry hand-held and countertop tape dispensers in several sizes. We have dispensers that can handle multiple rolls of tape. The versatile LTR dispenser handles up to eleven rolls of tape (on either 1-inch or 3-in cores). We also have hand-held dispensers for 1-inch and 2-inch wide tape. All of these dispensers work with all of our carton sealing, vinyl, and paper tapes on 3-inch cores, however, none of them support duct or gaffers tape - those rolls are too large. * none of the dispensers above support duct tape or gaffer tape - those rolls are too large to fit in them. 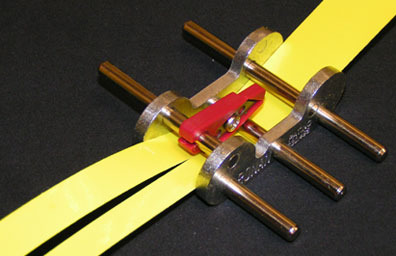 This unique, 2-inch chrome-plated steel and aluminum tape slitter works with liner-backed or fabric tapes from 1/2-inch to 2 inches in width. Simply move the cutting arm to the desired width, feed the tape into the slitter, lower the blade, and draw the tape through. Two cleanly cut strips emerge. It's fast, precise, and easy. The slitter can be narrowed down to slit strips as narrow as 1/4" width. It works great with reflective fabric tapes and any adhesive tape that has a peel-off backing or liner, such as our decorative metallic tapes. Note: to avoid having a mess of spaghetti when slitting large rolls, it is far easier to cut them into 10 to 20-foot long pieces and then slit the shorter pieces.